Emboldened by U.S. backing Saudi Arabia launched a campaign to finally subjugate Qatar into client state status. The plan has now reached a high point. A few hours ago Bahrain, Egypt, the United Arab Emirates and Saudi Arabia severed all ties with Qatar. All sea- and airspace have been closed for Qatari traffic and the land-routes severed. All Qataris will have to leave those countries within 14 days. Qatari diplomats were given just 48 hours. The immediate consequences are huge. Some 37 million passengers cross through Doha each year. But Qatar Airways now has to fly through Iranian, Iraqi and Turkish airspace to reach Europe. (If the situation persists the UAE owned Emirates Airways will likely order a huge bunch of new planes.) Half of the food in Qatar comes via Saudi Arabia through Qatar's only land border. 600-800 trucks per day can no longer pass. The 19 flights per day between Doha and Dubai are called off. Oil prices rose some 1.6% and the Qatari stock exchange tanked. The reasons for the immediate spat are manifold. It has only little to do with Iran. The Saudis accuse Qatar of supporting terrorists. That is like Britain accusing the U.S. of imperialism, or the mafia cutting ties with the mob over gangsterism. As Joe Biden remarked (vid) when still Vice President, both Wahhabi countries, Qatar and Saudi Arabia, have been funding and fueling terrorism in Syria, Iraq and elsewhere. But the Saudi view is that the more "liberal" Qatar is simply supporting the "wrong" kind of terrorists. The Qatari government and its mouthpiece Al-Jazeera installed and supported the Muslim Brotherhood government in Egypt. The Saudis put that government down by financing a military coup against it. Qatar is supporting the Muslim Brotherhood government of Turkey. It is supporting the Palestinian Hamas, also a Muslim Brotherhood affiliate. Qatar is financing various al-Qaeda aligned groups in Libya, Syria and Afghanistan. The Taliban have their only diplomatic mission in Doha. Until recently the Saudis have been financing ISIS. They are now mainly back at financing various other Jihadi groups in Syria under CIA control. The UAE is sponsoring the Libyan general Hiftar who is fighting Qatari supported al-Qaeda aligned groups. The Saudis are making nice with Israel and have no interest in the Palestinian cause which Qatar supports. There are diverting interests in hydrocarbons. Qatar is the world's biggest exporter of natural gas - a serious competition to Saudi oil exports. It has recently intensified its relations with other producers and customers in the Gulf region and beyond. More local and personal dimensions of the spat include many intermarriages and competitions between Saudi and Qatari tribes and families. There are rumors that significant tribal groups in the Saudi's Najd desert, especially the al-Tamim, have recently renewed their ties to Qatar under its current emir Prince Tamim Bin Hamad al-Thani. This was an "in your face" for the al-Sauds. Oman and Kuwait have taken no position in the fight and try to mediate. Turkey is allied with Qatar but has stayed suspiciously quiet. There is a new defense agreement between Qatar and Turkey promising Turkish support if Qatar is attacked. The Turkish military has a base in Qatar with some 600 soldiers. A huge share of foreign investment in Turkey has come from Qatar. The Turkish and Qatari government coordinate tightly in their common support for al-Qaeda and other Takfiris in the war on Syria. Key principals within the Trump administration, such as Defense Secretary Jim Mattis and CIA Director Mike Pompeo, hold views on Iran and the Muslim Brotherhood that are virtually indistinguishable from those in Riyadh and Abu Dhabi. Trump fell into a Saudi-Israeli trap. The Pentagon hawks have dreamed of an "Arab NATO" to fight Iran. The envisioned "Arab NATO" may soon have its first war but it will be against one of its members. The (not-satanic) "Orb" show and the unlimited U.S. support for Saudi Arabia have exacerbated the fissures within the GCC and will hinder any common operations. The U.S. military has huge interests in Qatar and other Gulf countries. Al-Udeid in Qatar is the biggest U.S. airbase in the Middle East. It is also the forward headquarter of the U.S. Central Command with some 10,000 U.S. soldiers and leads the fight against ISIS. The U.S. Navy fifth fleet is hosted in nearby Bahrain which has now declared a cold war with Qatar. Any spat or difficulty between the Gulf countries hinders U.S. military operations. In Washington an intense Saudi and UAE lobbying campaign against Qatar has been ongoing for months. A Saudi lobbyist threatened the Qatari ruler with the "same fate as Egypt's Morsi". In a reprisal hacked emails between the UAE ambassador Yusuf al-Otaiba and Israeli lobbying organizations in Washington were recently published. The documents show that the Zionist lobby organization "Foundation for the Defense of Democracy" is advising the dictatorship of the UAE on how to fight the dictatorship of Qatar. At the end of the "orb" show the Saudis and the U.S. pushed a document declaring various organizations and Iran "terrorist supporters." Qatar refused to sign it. Saudi clerics then declared that the Qatari al-Thani rulers are no longer considered to be "part of the Abdel Wahhab clan". That takes away the Wahhabi rulers religious legitimacy. Qatar had tried to calm the situation down. It announced that six of its soldiers had been wounded while fighting for the Saudis near Yemen. It expelled a few Hamas leaders from the country. A mediator was sent to Kuwait - so far to no avail. The extreme bullying of Qatar by the Saudis and the UAE, with total closure of all its borders, is designed to create an immediate capitulation. So far Qatar holds onto its course but in the end it is likely to fold. It will have to stop its support for "terrorism" i.e. the Muslim Brotherhood. Another scenario is a putsch in Doha with some Saudi puppet prepared to take over the realm. If that is unsuccessful a military move could follow. Qatar has little capabilities to withstand a potential Saudi invasion. 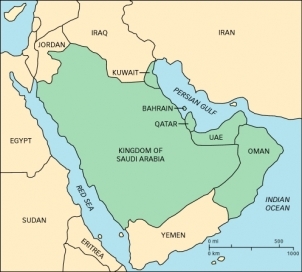 For Iran this is a chance to further blow up the GCC by intensifying its relations with Qatar. It could increase its food exports to the country and host Qatar airline flights. This in exchange for a Qatari retreat from Syria. The U.S./Saudi plan of confronting Iran through the GCC would then be in complete jeopardy. The Imam says: "More popcorn please." No matter how the spat with Qatar ends, the GCC unity has (again) been exposed as a sham. It can not be repaired. Saudi "leadership" is shown to be just brutal bullying and will be resisted. U.S. plans for a united GCC under Saudi leadership and U.S. control are in shambles. The linch pin of all this is the Saudi war on Yemen. The Saudis support the Hadi puppet government of Yemen and two years ago aligned the other Gulf states, including Qatar, to fight against the Houthi in north Yemen. They accuse the Houthi of receiving Iranian support. There is zero evidence for that claim. The war and the coalition have failed. Houthi resistance continues unabated. With Yemen sinking into a famine thanks to a Saudi border blockade and a Cholera epidemic rapidly extending, the war must come to a close. Kuwait, Oman and Qatar are talking with the Houthi in Sanaa. Last week troops from the UAE used helicopters to again fight Saudi supported militia around the southern airport in Aden. The U.S. and Britain urge for the war to end and, behind closed doors, threaten to withdraw their support for it. The Saudi under their new leadership overestimate their capabilities. So did Trump when he raised their role. The Saudi "apes with Macbooks" do not have the capabilities needed for a serious political actor in this world. Their money can paper over that for only so long. At the end of this war on #Yemen, the GCC states led by Saudi Arabia will collapse into oblivion. I do not know what will replace them.